All transactions are safe and secure with a reliable history in online purchasing behind each of our associates. 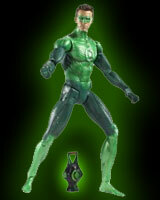 Buy the Green Lantern Action Figures, Sinestro and Hal Jordan Toy Figures to own Green Lantern clothing and merchandise. From a distance, this Green Lantern figure looks eerily similar to the movie character portrayed by actor Ryan Reynolds. Use your imagination to bring these movie characters the rest of the way to life, or choose toys based on the characters from the classic comic books. Portray the side of evil with Sinestro action figures or celebrate your allegiance to the Corps with a Hal Jordan figure. Get other toy characters like Abin Sur, Parallax and Kilowag. In addition to the Green Lantern Action Figures, Sinestro and Hal Jordan Toy Figures above, browse the Green Lantern Clothing Gallery for more apparel like men's and women's clothes, kids shirts or hoodies.